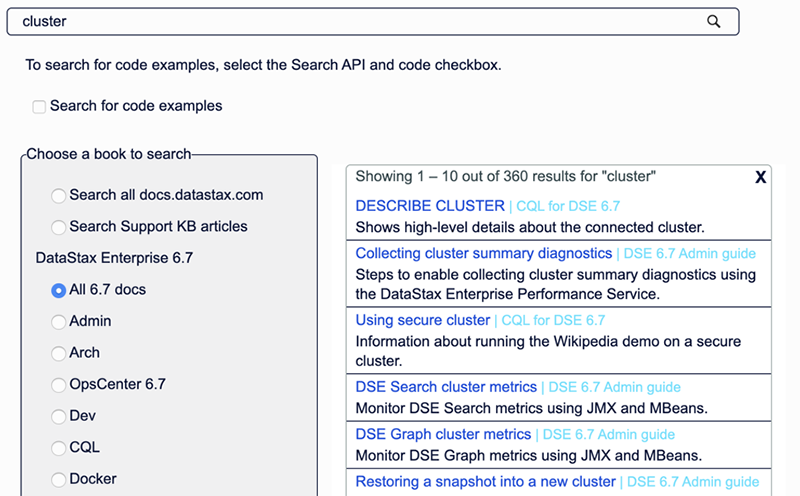 Search for DataStax docs allows you to search a specific guide or all maintained documents on docs.datastax.com. The Search field near the top of each page returns results only for the guide you're reading. This search field has auto-complete. Click the topic that you want to view in the auto-complete box. If you don't see the topic you're looking for, click the Search button. Click the topic you want to view. If you don't find what you're looking for, click Search all docs. Enter your terms in the search field, select the book and type, and then click the button. Search for code examples returns only code snippets. All DSE 5.1 docs searches the DSE Administrator, DSE Developer, and DSE Architecture guides. Select another guide to see its search results.